← WHAT ARE WE MODELING FOR THE NEXT GENERATION? Countless books have been published suggesting self-help advice for mothers and their sons to nurture their relationship, but none have offered both no-nonsense insight and humor with impactful faith-based take-away tools to help a mother shape her young boy into a successful man of Godly character. 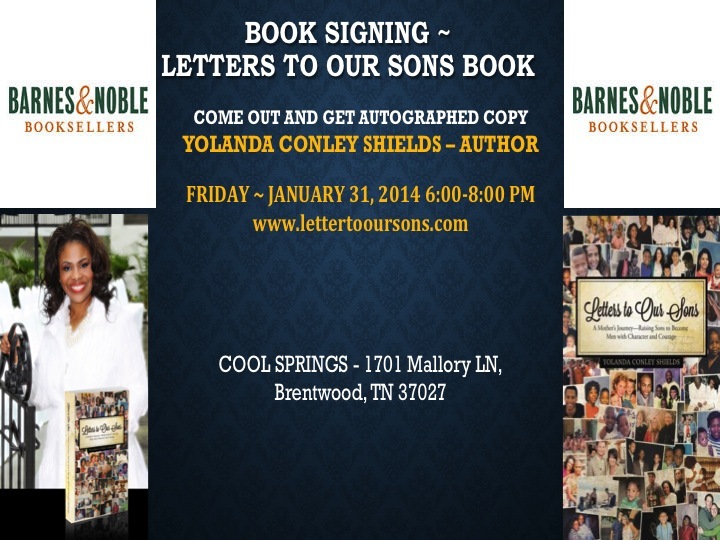 Letters to our Sons, Yolanda Conley Shields debut book is penned in a heartfelt, entertaining and motivational tone offering scriptural support as well as insightful steps to encourage mothers facing life’s challenges. With diverse, comedic and heartbreaking stories, Letters to our Sons captures the struggles and victories mothers face day-to-day raising their sons, and offers helpful and relatable words of wisdom and inspiration. This entry was posted in Uncategorized and tagged Booksigning, Brentwood TN, legacy, Letters, parenting, sons, Yolanda Conley Shields. Bookmark the permalink. Reblogged this on LETTERS TO OUR SONS. This book is a must read for mom’s that are raising sons single or married. You will read about the ups and the downs and the goos and bad of nuturing your sone to become that man that you prayeed that they would be. This book will definitly bless your life.